Dr. John Agar asked all the patients on the Home Hemodialysis group on Facebook a few weeks back, what additional features we would like on hemodialysis machines? I don't remember the exact words and I don't even remember what I answered. Thinking about it now, I feel that if there was an accurate way for hemodialysis machines to determine how much above my dry weight I actually was, I think it would make my life a lot easier. Dry weight is the weight of a dialysis patient assuming there is no excess fluid in the body. Since the kidneys of a dialysis patient do not work, excess fluid and toxins that healthy kidneys remove, start accumulating in the body leading to various complications. These are removed during the dialysis treatment. While toxins are removed automatically based on the concentration gradient between the blood and a fluid called dialysate and we usually do not 'set' the amount of these toxins to be removed, the fluid is removed based on a machine setting. You basically 'set' the machine to remove a certain amount of fluid. If you're a good boy or girl, this is typically under 1 to 2 litres. If, on the other hand, you're like me, a non-compliant patient, this could be up to 5 litres sometimes! Now the tricky part is figuring out how much to remove? Apart from the additional fluid, the patient's weight might have risen or fallen due to various other factors - exercise, nutrition, just after a meal etc. For us nocturnal patients, the last one of these is typically the culprit. Your weight may be off depending on how light or heavy your dinner was and how long after dinner did you check your weight to determine your fluid removal goal. Due to this, I have often tried to remove too much or too little fluid leading to all kinds of issues. If the hemodialysis machine could automatically detect the amount of excess fluid and advise me to remove a certain amount, I could either accept or ignore that advice. The technology I think is already available. 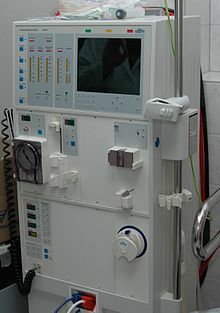 I have seen a machine some time back that used Bioimpedance to determine the amount of excess fluid in the body. It wasn't accurate enough though. By improving the accuracy and integrating this technology into the hemodialysis machines, I am sure many patients would be saved from complications such as cramps, hypotension and breathlessness due to wrongly setting fluid removal goals during hemodialysis treatments. Sorry that I have missed to see and read this post before and just come across today and so would like to share the below information which may be helpful to fix your Dry Weight. I don't think it is the Technology of Bioimpedance. Its actually a IVC Scanner. In Apollo, Jubilees hills, they DO a SCAN (the machine is similar to 2D-Echo Scanner) to figure out the patient Dry-weight. With this machine they scan the IVC (Inferior Vena cava), the large vein that carries the blood from the entire lower part of the body and connects to heart. if the patient is near about his/her Dry-weight, the IVC shows the required compression in SCAN. If the patient has some excess fluid in the body i.e with fluid overload, then IVC in the body gets dilated and it will show less compression in the SCAN. (This is what I could understand from the explanation while discussing with the doctor). With the help of this periodical SCAN, there, they slightly adjust the patient's UltraFiltration volume. this way it is useful in fixing the Dry-weight which normally changes due to various factors that you mentioned. Last Year, as I was suffering with uncontrolled hypertension, my Doctor advised me to first figure out the dry-weight before increasing the Dosage of medicines. But they were not doing this SCAN as OP diagnosis. One Doctor (PG Student) was doing Project study on this subject then, and he was doing this SCAN for all the Dialysis patients. Oh ok. Thanks for the information Murali.